Bhubaneswar: Ushering in Digital Life to the festivities of Durga Puja and Dussehra, Jio has come up with a unique digital showcase featuring beautiful collection of photographs and short videos of major Puja Pandals in the twin cities of Cuttack and Bhubaneswar. The digital showcase available on MyJio app for Jio users across the country features photographs and videos of five famous Durga Puja pandals each, in the cities of Bhubaneswar and Cuttack. This brings an exciting opportunity for millions of Jio users who could not make it physically to each of the pandals but wish to have glimpses of the famous Durga Puja, attractive decorations and thematic pandals in the twin cities of Bhubaneswar and Cuttack. With this, Jio has now become the only digital service provider to bring the famous Puja Pandals in the twin cities to all its users on just click of a button. The five Durga Puja digital showcases available on MyJio from the silver city Cuttack include the famed Chandi Medha (Silver Sanctum Sanctorum) of Chauliaganj, Jobra, Seikh Bazar, Chandini Chowk and Choudhury Bazar. The five thematic pandals fron Bhubaneswar which are being showcased on MyJio app include the Saheed Nagar, Rasulgarh, Bomikhal, Baramunda and Nayapalli. This will be for the first time that people from across the country will be able to see the exciting collection of photographs and videos of their favourite puja pandals and festive decorations from both Cuttack and Bhubaneswar. 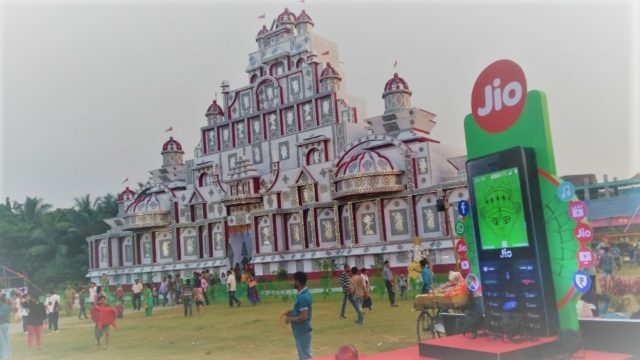 Jio has also created an attractive selfie zone with the popular and world’s largest selling Jio Phone as the selfie backdrop, near the Durga Puja Pandal in Baramunda in Bhubaneswar, wherein visitors can take selfie and share on social media platforms. Besides, Jio is also showcasing Jio Digital Life through attractive branding and product exhibition facilities at Shankarpur Puja Pandal in Cuttack, Jharpada and Baramunda puja pandals in Bhubaneswar along with Sector -2 Puja Mandap in Rourkela. It is worth mentioning that Jio has connected millions across the state and country with its full 4G network and truly transformed the lives of people providing an all new experience of Jio Digital Life. Like any other high-end 4G smartphone user, JioPhone users in the farthest parts of the state are also able to enjoy entertainment, education, information and other important services, at will. As per TRAI report for July, Jio has now become the second largest mobile service provider in Odisha with 64.27 lakhs subscribers and number one in broadband users.